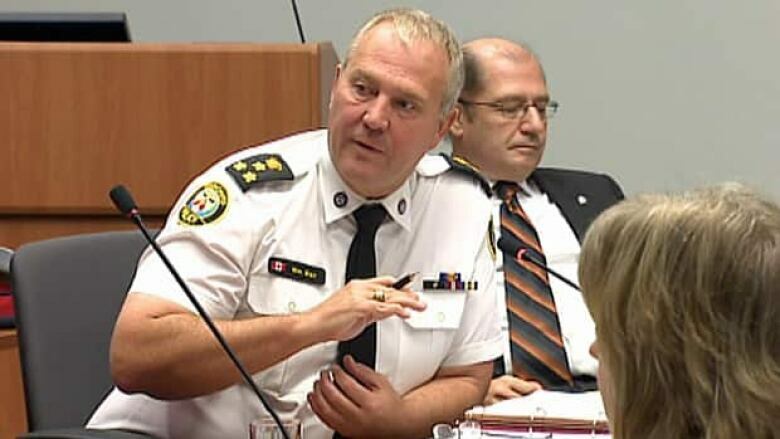 Toronto Police Chief Bill Blair wants to take another look at using photo radar cameras to trim law enforcement costs in an era of frozen police budgets. Toronto Police Chief Bill Blair wants to take another look at photo radar cameras as a way to trim enforcement costs in an era of frozen police budgets. Blair made the comments Tuesday during a round of media interviews. Police spokesman Mark Pugash said Wednesday that police are looking at new ways to use imaging technology as a cost-effective way to catch drivers who break the law. "There are a number of issues where technology can do a more effective and more efficient job of traffic monitoring," said Pugash. Toronto currently has cameras to catch drivers who run red lights. In use at about 180 intersections throughout the city, the cameras automatically photograph the licence plates of offenders, who later receive the photo evidence in the mail along with a $320 ticket. Pugash said Wednesday Blair wants to open the discussion about possibly using cameras to catch drivers who commit other violations, such as illegal left-hand turns during rush hour. He said using police officers to monitor intersections can impede traffic. It can also tie up officers' time with court appearances. "It’s very expensive to have an officer at an intersection," he said. "If technology can do it at a much reduced cost, we have to look at it." More controversial than intersection cameras is using photo radar to catch speeders. Photo radar speed cameras were introduced in Ontario in 1994 then scrapped less than a year later as the Mike Harris government came to power. Mayor Rob Ford said he does not want to see photo radar make a comeback. "I support the chief, I support the police, but I don’t support photo radar," said Ford Wednesday. "The people don’t support it. Taxpayers don’t support it, I don’t support it." Pugash said speed cameras are among the options Blair wants to examine. "Chief Blair is saying ‘Let’s have the discussion, let’s have the debate,’" said Pugash.